Now, the incidence of coli disease more and more, the degree has become more and more serious, from the former condition venereal disease to the main epidemic disease. Features: 1. Coli disease itself because of coli are widely distributed, serotype, bowel is toxicity, blood and cell toxicity, in the process of reproduction produces a large number of exotoxin and endotoxin, so has a great impact on the body, harm more widely. 2. The rapid propagation and division rate of coli can be divided once within 18 to 20 minutes, but it is difficult to eliminate and eliminate due to its rapid propagation speed and strong regeneration capacity. Because of the rapid propagation of coli, it is easy to develop resistance to nearly all antibiotics and chemicals. 4. Since coli disease is easy to be secondary to other diseases, the large number of virus venereal diseases and immunosuppressive venereal diseases now make escherichia coli common and difficult to treat. Doxycycline Hydrochloride is a kind of good drug. 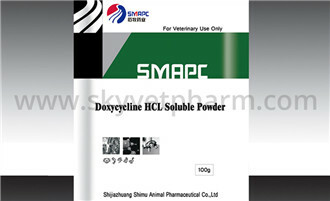 Doxycycline Hydrochloride For Pig Coli Disease, Doxycycline Hydrochloride For Chicken Coli Disease are very effective.